Yes, you read right. Today, I mowed the lawn. And I must say it was quite an awesome feat. Now granted, there were a few rough patches and I still need to rake up the clippings into the greenery bin, but I mowed the lawn nonetheless. Kristopher has been a little under the weather and the doctor instructed him to take it easy, no heavy lifting, and light activity. So, today, while the two of us worked in the garage and in the yard, I volunteered to the mow the lawn. He was surprised. 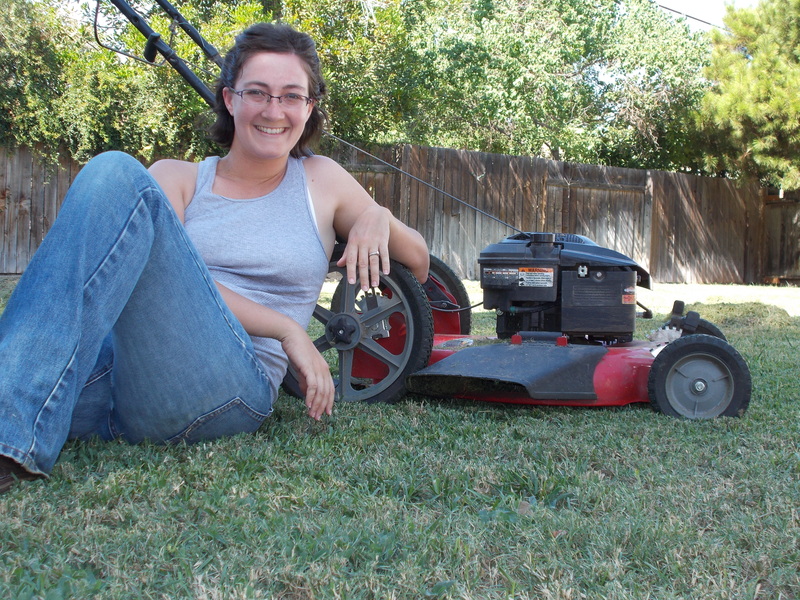 So was I.
I couldn’t resist a quick photo with my trusty lawn mower and my finished lawn. As I was mowing the lawn, which took quite a while, I spent some time thinking about the various tasks that Kris does versus the various tasks that I do, whether around the house, with the girls, in ministry. And in those moments I began to thank the Lord that I learned how to mow the lawn. Kris had shown me where to mow, where to point the mulch as it came flying out of the lawn mower, what lawn areas to avoid, and how to fill the lawn mower with gasoline if I should run out. He showed me how to do it and I did it. Why was I so thankful for this? Someday, Kris will no longer be with me. My dear husband will go to be with the Lord and I will be left alone. It might be tomorrow or it might be 30 years from now. The fact of the matter is, someday I will be a widow. In the past many months I have watched my mother, a recent widow, struggle through the various tasks that “Daddy used to do.” I remember vividly standing in line with her at Costco when they told her the membership was expired. She was so frustrated and remarked to me, “Daddy used to take care of this.” It broke my heart. I’ll never forget that moment. What will happen to me as a wife when my husband dies? For those of you who know my husband, he is an incredibly gifted man who is able to care for our family and our home in ways no other can. But I can try. I can try to learn from him all the amazing tools, tasks, and fix-it-tricks. And I believe, this is what every wife should be doing. Yes, there will always be things that only one of us can do–hence the beauty of marriage as we compliment one another. But, there are also things that we can learn from one another, preparing–not morbidly, but wisely–for that awful day when we are alone. For in that day, the grief will be overwhelming and the thought of tackling even the simplest of tasks will be daunting. Wives, consider the following tasks that your husband might currently take care of. Do you know how to do it? Sometimes I am resistant as my husband tries to teach me things. I am prideful and believe that I am an independent woman who needs not a man to teach her. It is foolishness. Today, I making a commitment to no longer resist. The Lord has blessed me with a wise and strong husband who has been faithful to lead this home. But someday, I too will need to lead. And like the women of Little House on the Prairie, forced to harvest the grain while the husbands are in counties afar looking for other sources of income, I too will need to rise to the task and care for my family. Today, I learned to mow the lawn. But, what if I should pass before my husband? Only the Lord knows our final hour. What if Kristopher is left alone? Well, in that case, it is probably best that I teach him how to make my famous garlic and cheese mashed potatoes! fix a flat tire.” Those two jobs I will gladly delegate to any good looking mechanic available. I call that smart independence.